Richie Power celebrating Kilkenny's 2015 All-Ireland final win. KILKENNY ALL-IRELAND winner Richie Power is set to travel to the Croatian captial Zagreb to see a specialist about his persistent knee injury, in what is his ‘last chance’ to prolong his hurling career at club level. In January 2016 Power accepted defeat in his fight to remain as an inter-county hurler after spending the last few seasons of his Kilkenny career battling knee problems. But he made a dream return at local level last winter, helping Carrickshock regain senior status in Kilkenny after they had suffered the despair of relegation the season before. From there the south Kilkenny side journeyed through Leinster and their campaign concluded in a fairytale fashion with Power striking 0-6 in the All-Ireland intermediate club final victory in February. 15 years after playing in his first All-Ireland final success at Croke Park with the Kilkenny minors, Power was again part of a triumphant team climbing the steps of the Hogan Stand and the impact of this success was all the greater considering the hardship he had endured. In the wake of that game, Power shone a light on the extent of the work required to get him fighting fit for games. Before that All-Ireland club decider in Croke Park, he stopped off at the St Judes club in Templeogue in Dublin to put in 40 minutes work on an exercise bike in their gym. Since that game, Power has not featured in Carrickshock’s 2017 senior campaign in Kilkenny. He is now preparing for a trip to the St Catherine hospital, that has been facilitated by former Kilkenny hurler David Byrne. Richie Power was at GAA Headquarters today for the launch of this year’s Bord Gáis Energy Legends Tour Series. “He actually hurled with Kilkenny back in the 90′s. He is working with an American company, they are associated with this hospital in Zagreb. “He said it is worth going over to talk to the surgeon over there, he more or less organised the consultation. “I’m going over to Croatia in two weeks to see a specialist, doing a bit of investigating into stem cell treatment. “They want to do a few scans and they will be able to tell me whether the procedure will work or not. “It is something I haven’t done. I have went down all avenues at this stage bar this one so this is pretty much last chance. I’m just hoping for the best really. “In Zagreb, they have done a lot of trials and investigations. The surgeon himself has been very interested in it for the past few years, they more or less told me he is the best guy in Europe. “I’ve done Trinity, Santry, I’ve gone up north, I’ve sat down with Aussie Rules teams when they were over, I got that set up. It’s not just hurling that is compelling Power to hop on a plane for this trip. Getting back on the pitch with Carrickshock is one objective, easing the pain in his knee for day-to-day life is another. “I’m only 31 at the end of the day. I retired when I was 29, it isn’t something you want to do, but it has just materialised that way. “I think the procedure is more about quality of life and getting longevity with my own knee. “It isn’t about getting back hurling or getting me back on the field. If I get it done and I feel well enough to go back I’ll go back, if not I’ll just have to draw a line under it. “You need to start thinking long term, family and stuff like that. I’d love to be able to wake up every morning pain free, to be able to walk without the fear of your leg going from underneath you. The root of Power’s problems can be traced back to an injury-wrecked 2015 season. 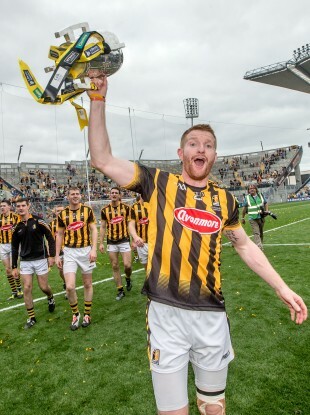 He entered that championship off the back off of a 2014 campaign where he went on a goal-scoring blitz with four strikes in the last three games of Kilkenny’s All-Ireland winning run. “I had three operations in 2015 in the space of eight or nine months. That is where the real damage was done. “I probably didn’t take enough time to recover from these procedures, trying to rush back. “I was advised medically, but that is just what you do when you love the game, you want to get back. “I felt after 2014, I was 28, I said to myself if I can get two or three years like this injury free you could have your best years. “I picked up an injury in January in pre-season training, went under the knife, never came right. “I played 12 minutes for Kilkenny in 2015, that was after three operations. You would have to question was it worth it? “Obviously I came out with another All Ireland medal, but it ended up costing me my inter-county career and a lot of club time. Email “Kilkenny All-Ireland winner heading to Zagreb hospital in 'last chance' to save hurling career”. Feedback on “Kilkenny All-Ireland winner heading to Zagreb hospital in 'last chance' to save hurling career”.